I loved coming back to Wissett in the early spring, on one of those days which are still hard to believe given how long the winter has been. The birds seemed pleased with the day as well, providing a soundtrack to my long freewheel down the hill from Spexhall. 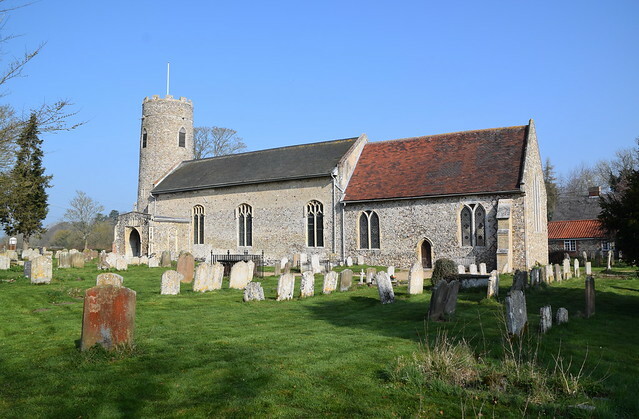 I crossed the busy Halesworth to Harleston road, pushing my bike across the little wooden bridge which spans the drainage ditch along the north side of the churchyard. 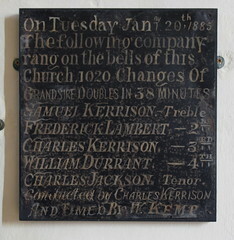 It is there for a good reason, for in 1968 the flood water rose so high here that the organ was destroyed. 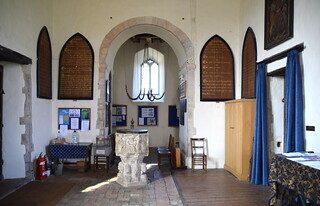 Wissett church is one of those that you can tell is going to be lovely even before you step inside, the long nave and large chancel setting off at a march from the tall round tower. 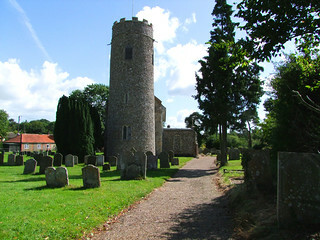 The east end was rebuilt to repair damage from the Great Storm of 1987. 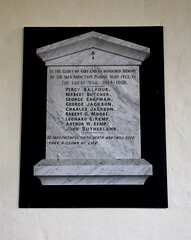 Neighbouring Uggeshall was one of three Suffolk churches that lost their east end completely that night. 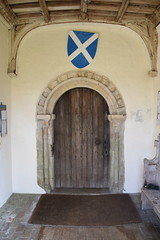 The feeling is of Perp-elaborated Norman, a happy combination, and you step through a Norman south door, its mouldings filled with madly grinning faces. 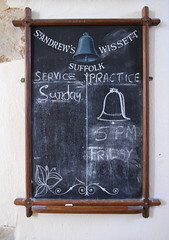 Mortlock describes this range as 'splendidly pagan', and the very name "Wissett" may come from a Norse word meaning 'pagan temple goers'. 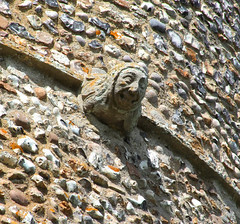 It is not too fanciful to think that the tower may have been built in the lifetimes of people whose grandparents had told them of the pagan days, if that doesn't sound too Arthur Mee-ish. 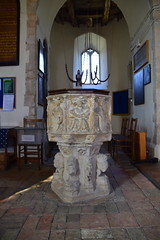 The font is one of the finest of those typical East Anglian fonts with lions and woodwoses on the stem and angels on the bowl. 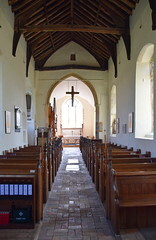 One of the Woodwoses stands on one leg with a nonchalant air.The pammented floors offset it perfectly, and so the long, narrow aisleless church leads the eye to the chancel, opening out in a haze of light. 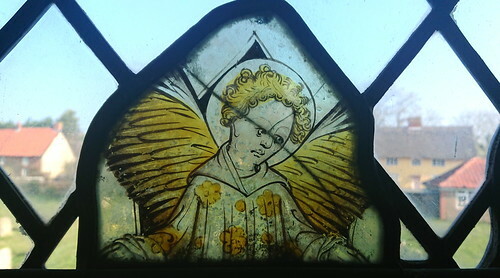 There is so much light in the church because there is so little coloured glass, and what there is is uncommonly good, especially the cluster of 15th Century East Anglian work in a window on the north side of the nave. Three of them are angels. 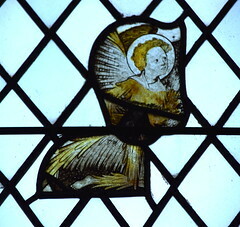 One of them is kneeling and holding a chain, and so is obviously a censing angel from a veneration scene of Christ on the cross. 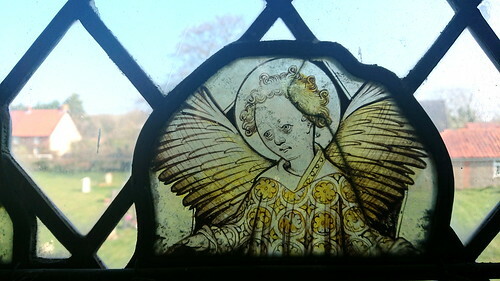 The other two appear sad, perhaps pensive, but I think their expressions are intended as awe, because the angle of their heads suggests they are looking down at a Nativity scene, in which angels were traditionally shown leaning on the walls of the stable looking down. The size of the three angels an idea of the scale of the lost scenes they came from, and the extent of that which we have lost. 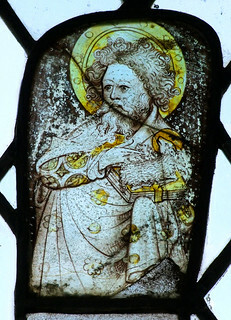 The other figure is a venerable and heavily bearded St John the Baptist, who does not look quite as severe as the Gospels might have suggested him. Indeed, he appears to be playfully tickling his little lamb. 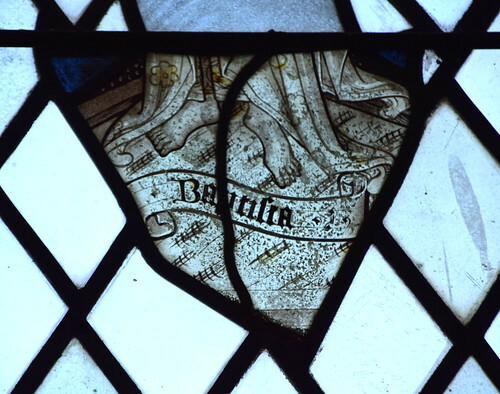 The surviving legend with part of his name below him is decorated with barleycorns, the hallmark of the Norwich school of glass makers. 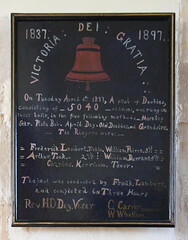 Under the tower, boards record feats of bellringing carried out towards the end of the 19th Century, while another board reminds us that the tradition survives here, giving times of service and practice. 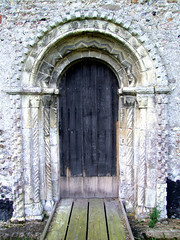 Even more recent is Peter Ball's sinuous sculpture of St Andrew set in a medieval image niche in a window splay on the south side of the nave. 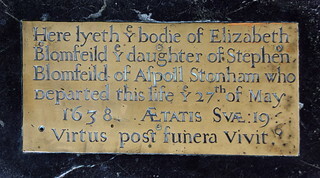 His work will be familiar to visitors to Ely and other cathedrals. 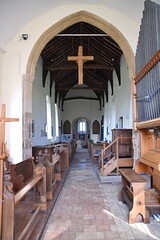 The straw cross hanging in the chancel arch was produced for a flower festival back in 1973. This struck me as a mark, not only of continuity, but of resilience. 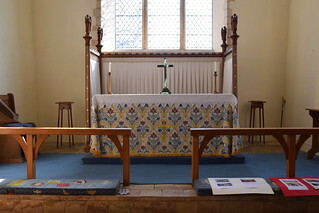 Another reminder, if we needed it, that the main destiny of our medieval churches is not to be contemporary worship spaces, but to be the soul in stone at the heart of their communities, and as witnesses to larger truths, just by raising their heads above the rooftops and above the fields.